The European Poker Tour Vienna festival, held at the Hofburg Palace in Austria’s capital city, played host to 40 tournaments from March 19 – 29. The centerpiece of the series was of course the €5,300 EPT main event, but we’ll get to that in a moment because the side event at this series also made it’s impact felt on the Player of the Year race standings, especially at the very top of the list. Poland’s Dominik Panka regained the lead in the rankings this week as a result of two final-table finishes during the EPT Vienna festival. Last week he finished eighth in the Eureka Poker Tour €2,200 high roller and then just days later placed fifth in another €2,200 side event. These two scores earned him over $46,000 and 315 POY points, which were just enough to propel him past Mike McDonald to regain the lead. Panka had already won two tournaments in 2014, starting with the gigantic PokerStars Caribbean Adventure $10,300 main event. He topped a field of 1,031 players in that tournament, earning $1,423,096 and 2,400 POY points for the win. He followed that up by taking down the €10,300 high roller event at EPT Deauville for another $371,498 and 600 points. He now sits 115 points ahead of McDonald. The 2014 PokerStars European Poker Tour Vienna €5,300 no-limit hold’em main event attracted a record field of 910 players, building a €4,413,500 ($6,087,982 USD) prize pool, by far the largest in the event’s history. In the end it was 27-year-old Ukrainian Oleksii Khoroshenin who emerged victorious after making a deal three handed with runner-up Anthony Ghamrawi and Marko Neumann. German pro Neumann was the overwhelming chip leader when the deal was made, and as a result his €638,127 ($879,716 USD) was the largest despite the fact that he eventually went out third. 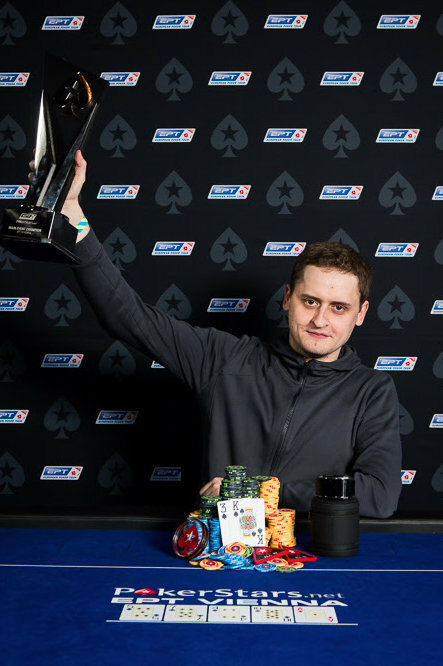 For the win Khoroshenin scored the €578,392 ($797,366 USD) first-place prize, 1,824 POY points and the honor of being the first-ever Ukrainian EPT champion. As a result of the win Khoroshenin, who had already made a final table in an EPT Deauville prelim, has been catapulted into tenth place in the overall POY standings. The home country hero, Austrian Anthony Ghamrawi, earned $615,514 and 1,520 POY points for his strong showing, which was enough to move him into 19th place in the overall POY rankings. A total of 182 entries were made in the $1,100 buy-in in the Card Player Poker Tour Atlantis main event in Reno, Nevada. From that sea of twenty tables emerged the eventual champion, Erkut Yilmaz. For the win the Sacramento, California resident earned $42,665 and 336 POY points. Yilmaz defeated Vincent Remmel heads-up to capture the title. This was the fourth largest score of Yilmaz’s career, and his third live tournament title. In 2013 he finished 61st in the WSOP main event for $123,597.